At long last, winter is arriving – the temperatures are starting to drop here in sunny Colorado, a brisk coolness refreshing everything in its path. Time to break out your favorite flannels and your best hot cocoa mixes! Winter is full of charm, bringing sparkling snow and cozy evenings cuddled up with your favorite movie and a warm mug of something delicious. Want to up your winter game? Here’s a delicious winter recipe to warm your day and delight your tastebuds! Don’t forget to add a dropper of CBD tincture at the end to give yourself an extra wellness boost! I’m a big fan of food that’s delicious, comforting, and has a little twist for personality. Fanny Slater’s delicious new book, Orange, Lavender and Figs totally does that for me. Her recipes are exquisitely tasty, and surprisingly healthy! She inspired me to rethink how I explored flavors – I didn’t know how vital figs and coconut milk were in savory winter cooking until I started using her fabulous creations. 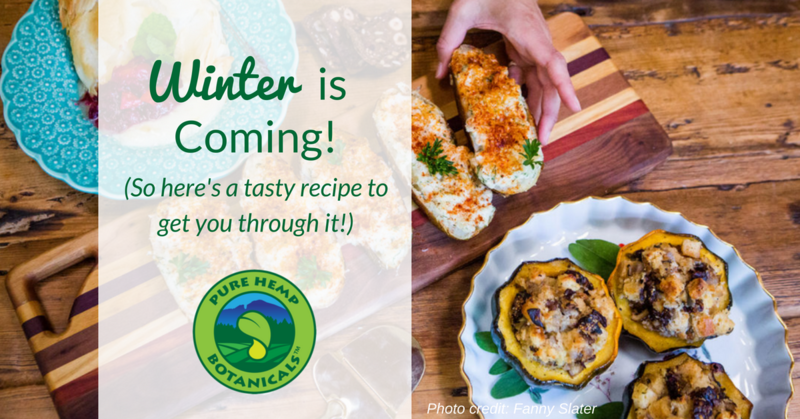 Here’s a great winter holiday dish that looks beautiful and tastes incredible! 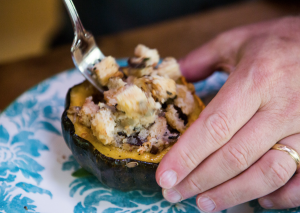 Stuffed squash will never be the same again. Cut a small slice off the rounded side of each acorn squash half so they sit upright. Evenly drizzle the center of each squash with 2 tablespoons olive oil and the maple syrup, and season generously with salt and pepper. Place the halves on a baking sheet and roast until tender but firm, about 30 minutes. Meanwhile, toss the shallots and shiitakes with the remaining olive oil, and season with the sage and salt and pepper. Spread the vegetables onto a baking sheet and roast until the shallots are translucent, 15 to 20 minutes. In a large bowl, combine the roasted vegetables with the gluten-free bread cubes and figs. Pour in the melted butter, coconut milk, and then the stock (a few tablespoons at a time) until the stuffing is moist but not soggy. Season to taste with salt and pepper. Fill each squash cavity with the stuffing, and bake until topping begins to brown, 20 to 25 minutes. Garnish with the fresh parsley. Now, if you’re anything like me, this is where the hard part comes in: not eating them all yourself! When I put on a fancy-schmancy dinner party and use her recipes, all I want to do is stuff my face with all the amazingness simmering on my stove. If you want to add our tincture to the recipe, put a few drops into your stuffing mix once you’ve put it in the individual squash halves, before sprinkling the parsley on top. It might just be your most relaxed holiday meal ever. Bon appetit and be well!